Already an existing user of Motorcentral? If you have already registered for the demo version of Motorcentral and successfully installed but wish to update to the latest version, see Updating Motorcentral. 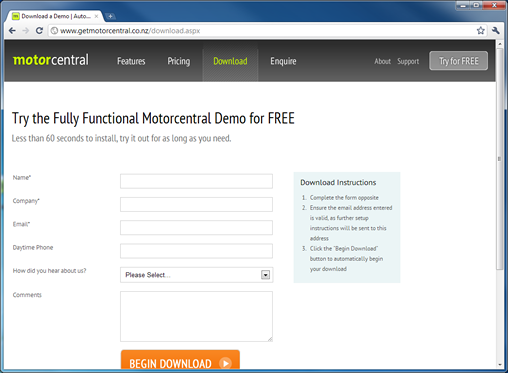 Visit the Motorcentral download page in any web browser (eg. Microsoft® Internet Explorer), and complete the Registration Process. » Experiencing issues with the Registration Process? Contact our support team here. Once you have completed the Registration Form hit the Begin Download button. 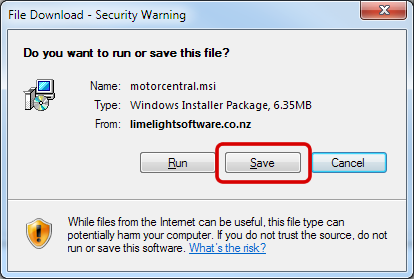 If completed successfully you will be directed to a new page and the download will automatically begin. You will be sent further instructions on connecting to the demo database and how to login via email (sent to the email address you entered during the Registration process).